If food waste was a country, it would be the third largest emitter of greenhouse gases after the US and China. This shocking statistic should be enough for anyone to realise that food waste is a problem we need to act on, and it is something anyone can play a part in. Tackling food waste is especially important in London, where it costs the average person £200 a year. As well as this, for every 5 bags of shopping bought, one is thrown away with food that could have been used to feed hungry mouths. Reducing food waste has benefits for us both personally and socially, as well as for the environment. So what can we do to help combat it? Too Good To Go is a social enterprise aiming to reduce food waste in a way that benefits both businesses and consumers. The free app allows consumers to purchase a portion of food that would be thrown away at the end of service for a reduced price. The customer then goes to the eatery in a time slot before closing to pick up their pre-purchased food. The concept has been taking Europe by storm and has already made a huge impact in London with almost 100,000 meals being saved since the app came to the UK in 2016. Large chains such as Yo! Sushi, Chop’d, Sofitel and Mitchells & Butlers are all taking a leading position in the fight against food waste by partnering with Too Good To Go. With over 1000 stores signed up to Too Good To Go in the UK already, 9 of these being in Croydon, there is a huge choice with more restaurants, cafes, bakeries and other food businesses joining the food waste revolution daily. Too Good To Go is an app that aims to reduce food waste by allowing food stores to sell surplus food at the end of the day to customers for a reduced price. 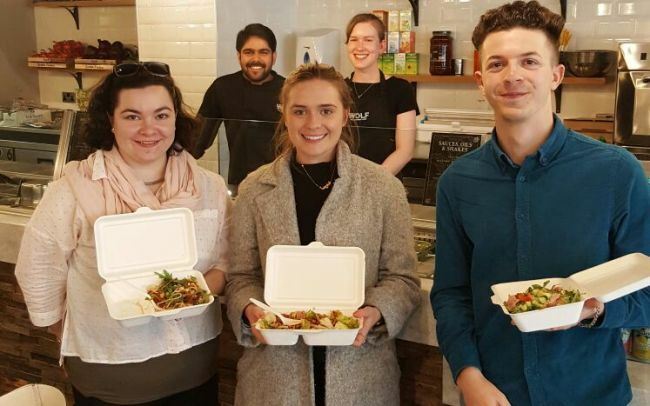 Launched in the UK in 2016 the London-based team have gone on to save 2 million meals from landfill in 6 different countries. The app is available to download for free on Android and iPhone. For every 5 bags of shopping bought, one is thrown away with food that could have been used to feed hungry mouths. Tackling food waste is especially important in London, where it costs the average person £200 a year. We're trying to use Too Good To Go as a vehicle to catalyse public discussion on the subject of food waste. Whilst the Too Good To Go app encourages users to consume 'waste' with the goal of getting the message across that in a lot of cases, what we perceive to be waste isn't actually waste at all - it's perfectly good food that just gets thrown in the bin because there's nobody around to eat it. Gradually, we're making an impact - and hopefully we'll be able to contribute to a shift in attitudes over the years to come, with the result being a more sustainable London for us and our future generations. A great deal of environmental challenges pose a threat to modern-day London. It's been well-documented that food waste is on the rise, and perhaps in the past we haven't been treating this as a tangible threat to our quality of life due to the relative lack of coverage it receives in comparison to other areas.